Maltodextrin, Natural And Artificial Flavorings, Sucralose, Acesulfame Potassium, Silica, Allum Lake Red #40. HemaVol is so powerful and so precisely dosed that in order to achieve maximum plasma volumization, it should only be taken on training days and no more than 4 times per week. For best results, drink 12-24 ounces of water with each serving. Consume 1-2 servings(1-2 scoops) approximately 20-30 minutes before your workout. Maltodextrin, Natural And Artificial Fruit Punch Flavor, Sodium Bi-Carbonate, Sucralose, Acesulfame-K, Silicon Dioxide, and Beet Juice Powder. Add 1-2 scoops of Hemavol to 12-24 oz (350-700ml) of water, and consume about 30 minutes prior to training. Mix in a shaker cup or stir in a glass. Adjust water to taste. On your days off, take 1-2 scoops of Hemavol to aid in recovery. Maltodextrin, Natural And Artificial Tangerine Flavor, Sodium Bi-Carbonate, Sucralose, Acesulfame-K, Silicon Dioxide, and Beet Juice Powder. Maltodextrin, Natural & Artificial Watermelon Flavor, Artifical Lemon Flavor, Sodium Bi-Carbonate, Sucralose, Acesulfame-K, Sodium Dioxide, and Beet Juice Powder. For best results, consume 1-2 scoops of HemaVol on a completely empty stomach, 20-45 minutes prior to your workout. To ensure the largest pumps possible, drink your HemaVol with at least 20oz of water per serving. HemaVol can be used for both intense pumps as well as enhanced endurance. Not for use in people under the age of 18. Consult your health care professional before using this or an other dietary supplement. Follow label directions and do not exceed suggested dosage under any circumstances. This product should not be used by people with the following (but not limited to) conditions: cardiovascuular disease, heart disease, renal or hepatic disease, people who have high or low blood pressure, diabetese or who are being treated for erectile dysfunction; people taking any medications for any psychiatric or mental disorder or by people who are pregnant or attempting to become pregnant. Not for use in nursing mothers. Discontinue use immediately if exessive sleeplessness, tremors, dizziness, nervousness, headaches, or heart palpitations occur. Maltodextrin, Natural Lemon Flavor, Artificial Lemon Flavor, Sodium Bi-Carbonate, Sucralose, Acesulfame-K, Silicon Dioxide, And Yellow #5. On your days off, take one serving of Hemavol up to twice daily to aid in recovery. Add 1 scoops of Hemavol to 6-12 oz (175-350 ml) of your favorite preworkout beverage or supplement, and consume about 30 minutes, prior to training. For an extreme pump, add two servings of Hemavol to 12-24 oz (250-700 ml) of your faovrite beverage. This product is only intended to be consumed by healthy adults 18 years of age or older. Consult your health care professional before using this or any other dietary supplement. Follow label directions and do not exceed suggested dosages under any circumstances. This product should not be used by people with the following (but not limited to) conditions: cardiovascular disease, heart disease, renal or hepatic disease, people who have high or low blood pressure, diabetes or who are being treated for erectile dysfunction; people taking any medications for any psychiatric or mental disorder or by people who are pregnant or attempting to become pregnant. Not for use by nursing mothers. Discontinue use immediately if excessive sleeplessness, tremors, dizziness, nervousness, headaches or heart palpitations occur. Do not use if the seal is broken or missing. Keep out of reach of children. Maltodextrin, Natural Watermelon Flavor, Artificial Watermelon Flavor, Sodium Bi-Carbonate, Sucralose, Acesulfame-K, Silicon Dioxide, Beet Juice Powder. Hemavol is so powerful and so precisely dosed that in order to achieve maximum plasma volumization, it should only be taken on training days and no more than 4 times per week. For best results, drink 16-24 ounces (475-710 ml) of water with each serving. Consume 1-2 servings (5-10 caplets) approximately 45-60 minutes before you workout. If you desire all day long pumps, consume 1 serving upon waking, and an additional 1 serving 6-8 hours later. NOT FOR USE BY INDIVIDUALS UNDER THE AGE OF 18 YEARS. Keep out of the reach of children Not for use by pregnant or nursing women, or persons under the age of 18. This product is intended for use by healthy individuals only. Always consult a physician before beginning this or any dietary supplement and/or training program. Individuals with allergies to aspartic acid should not use this product. Do not use this product if you have a family history of prostate of kidney disease or endocrine condition. If you are taking any dietary supplement or prescription drugs, consult with your physician before using the product. 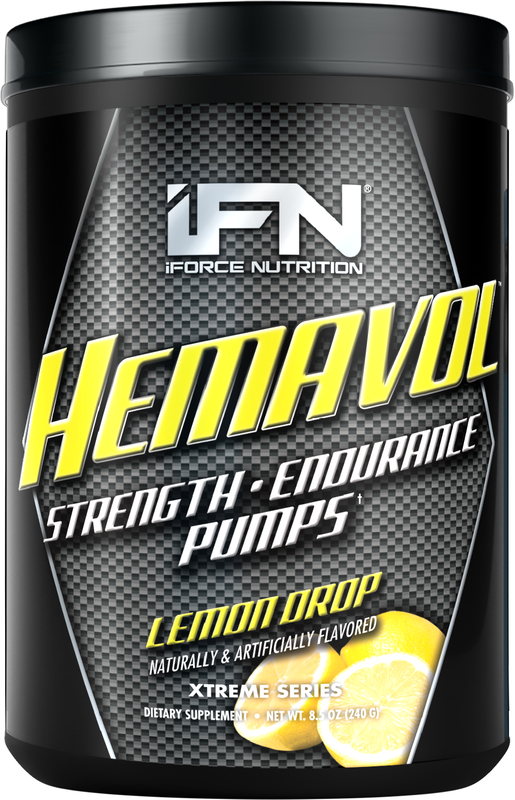 iForce Nutrition's HEMAVOL is our top-rated pre-workout supplement (by far) -- it delivers the right PUMP ingredients that you need - without stimulants. If you are cycling off stims for a little while, but want to keep amazing pumps going, this product is an absolute must! With Hemavol, you're guaranteed to make the most out of every workout to increase muscle growth and improve your strength and conditioning. It will change the way you see workouts, all thanks to its hemodynamic technology that is way ahead of its competition in terms of the results that it can give you. Being stimulant-free, this supplement is safe and effective. If you want to learn more about Hemavol, check out the review below and read on! Mike and CJ, PricePlow's resident review team, had an incredible arm day shown below. There is no beating the lemon drop flavor (think: Lemonheads candy), but rumor has it that the blueberry pomegranate flavor (new in 2014) will give it a run for its money! iForce Nutrition Hemavol: Will it Work For You? Hemavol is really a promising workout supplement, because it doesn't just give you empty promises, it also backs its every word with results that really show. Hemavol works by combining two matrices that promotes optimum plasma volumization. These matrices are Hemodynamix matrix and Vasodilation support matrix. The two matrices work hand-in-hand to make sure that you get the best workout possible with Hemavol. Specifically, Hemavol's Hemodynamix matrix is formulated to make sure that the actions of the NOS Enzyme is increased greatly to promote an increase in the key compounds which are responsible for producing NO or Nitric Oxide. If you combine NOS enzyme augmentation to the increase in NO-producing amino acids, the result is the improved or even forced transfer of water, plasma, as well as glycogen in to the cells of your muscles, so that it increases their volumes dramatically. In essence, Hemavol's Hemodynamic matrix led to the creation of a cell volumizing pump that leaves nothing but obvious results. Hemavol's second matrix, the Vasodilation support matrix is a pool of hand-picked compound combinations that works to magnify the results of the previous matrix, the Hemodynamix matrix. What these compounds do is that they increase and improve the NOS enzyme activity as mentioned earlier when Hemodynamix matrix was discussed. Vasodilation support matrix also works for the maintenance of your muscle cells, resulting to the increase of your endurance, a big boost in your vasodilation, as well as the modulation of the enzyme Arginase. If you combine all these to help you with your workouts, you'll see your endurance greatly improved, and you'll have strong and long-lasting pumps that you won't get from just any other NO supplements in the market today. And to add an icing to the cake, the effect of Hemavol can build up over time, so the more you take it for your workout, the more effective it gets. So if you still doubt that Hemavol would work for a normal person like you, perhaps the best way to clear your doubts is for you to try and see actual results. You'd be surprised at how strong and well-built you'll get. 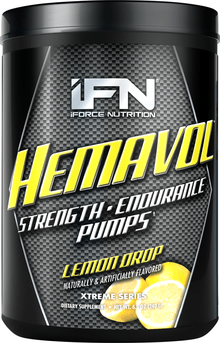 You'll be able to endure longer, harder workouts without any hang-ups, all thanks to iForce Nutrition's Hemavol. Hemavol: What Can You Expect From It? One thing that you can expect upon using Hemavol is the swelling of your muscle cells. This phenomenon is called volumization, which happens when subcutaneous water is eliminated and is fed directly to the muscle cells. In effect, this increases your strength, improves your endurance, and allows you achieve bigger pumps. As your muscles expand, your pumps will be more intense and long-lasting, resulting to a highly effective workout. These are all due to the unique and advance compounds found in Hemavol. Aside from the volumization of your muscle cells, you'll also be able to achieve peak vasodilation. Peak vasodilation occurs when your body is forced to produce more NO or nitric oxide. This is possible through the help of the augmented NOS enzyme that ramps up the production of NO, and inhibits reflux or the negative feedback loop that usually prevents pumping massive amounts of NO to increase NO levels. Consequently, Hemavol increases the flow of blood to your muscles, so more and more nutrients, oxygen, and water are force fed into your muscle cells. Your veins will vasodilate or grow bigger in diameter in order to accommodate a greater amount of nutrients coming into your muscle. So even when you pump and exert energy, your muscles will continue to function because they have enough fuel to burn, thus allowing you to build your body in just a short amount of time. The best thing about Hemavol is that it doesn't contain synthetic stimulants that could be detrimental to your performance in the long run. It only contains effective ingredients like Agmatine Sulfate, Citrulline Malate, Glycerol Monostearate, and Norvaline. You don't have to worry about your body crashing after every intense physical activity that you do, or suffer from jitters as the stimulants lose their effect. You can even stack it with other supplements so that you'll achieve more even in a short amount of time.